Teaching on the leading edge of new concepts for healthcare solutions. Our service is friendly, personal and prompt. Our 800-654-2387 number is available to you to ask questions and to assure that your continuing education needs will be met in time for your renewal. By downloading the course material and entering your answers into our web site, you can have your credits as fast as you can take the course. If you choose to fax or mail your answer sheet, we will process it within 24 hours of receiving it on business days. If you provide a fax number on your answer sheet, we will return your certificate by fax before we mail the original back to you. 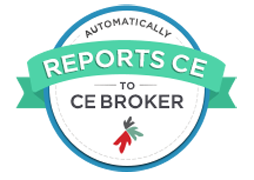 In Florida, course completion information is automatically submitted to CE Broker in batch once a month. This usually occurs the first week of each month. 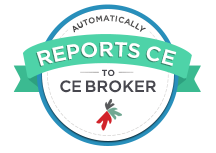 The date that we submit the hours to CE Broker is not as important as the date you complete the course. This is the date your board is interested in, and it is what we report to CE Broker. So, for example, even if we submit hours to CE Broker on April 2nd, what we submit might be your completion date of March 19th. If your license expired on March 31st, you are in compliance because the date reported is March 19th. All boards allow providers several months after expiration dates to enter completion information. We keep our records very secure. Names and addresses are never sold or shared with other companies. All of your course completions are maintained for a minimum of six years. You can always obtain a listing of the courses you have completed and certificates can be replaced whenever you need them at no extra charge. It’s all part of our personalized service. We’ll be there for you. "I use CFTF for all mandatory CEUs and many other CEUs. GREAT JOB!!!! Truly fantastic instructor!!!"